Follow the directions exactly, and this batter will bake into a rich brownie with a layer of pudding underneath. Preheat oven to 350 degrees F. Grease two 9-inch square baking dishes. 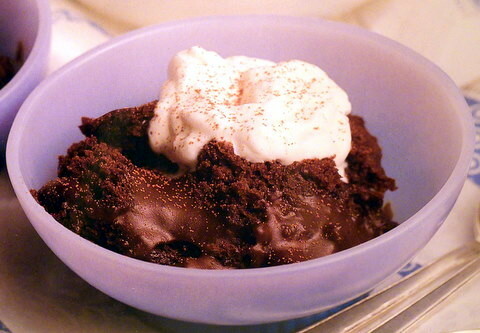 Combine the brownie mix, oil, eggs and 1/4 cup water in a medium bowl. Mix well, about 1 minute. Divide the batter evenly between the prepared baking dishes. Combine the brown sugar and cocoa in a small bowl. Mix well. Sprinkle 1/2 of the mixture evenly over the batter in each baking dish. Pour 1/2 of the boiling water on top of the brown sugar mixture in each baking dish. Bake until set, about 23 minutes. Serve warm with ice cream or whipped cream, if desired. Makes 10 to 12 servings. To reheat leftovers, cover with plastic wrap and heat on Low in the microwave. It is also delicious served cold. Hi Emily, I was happy to see your recent comment. I haven’t been visiting as mush either. I wish I had more time to get on my computer. It is winter and things do slow down a bit. I hope all is well with you and yours. I see you are still posting delicious recipes. This one is awesome. We have company right now and it would be a good time to try this. Mmmmmm.